Delaware is a state located on the Atlantic Coast in the Mid-Atlantic and Southern regions of the United States of America. Delaware is named for Thomas West, 3rd Baron De La Warr. Population estimates by the Census Bureau for 2005 place the population of Delaware at 843,524, moving from the 45th most populous state at the 2000 Census to the 46th most populous. Despite this, it is the 7th most densely populated state with a population density of 320 more people per square mile than the national average, ranking ahead of states such as Florida, California, and Texas. 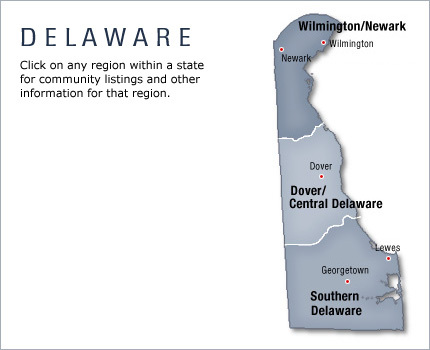 Delaware was one of the original Thirteen Colonies and is known as the “First State”, officially referring to the fact that it was the first to ratify the United States Constitution. Even though the states were already known as such prior to the Constitution, the motto itself is still historically accurate, as Delaware was indeed the first state to ratify the Articles of Confederation, the first legal document establishing the new American political entities as “states” (although the Declaration of Independence refers to them as “States”). Commemorating Delaware’s ratification, Constitution Park (one block from where Dover’s Golden Fleece Tavern once stood) features a four-foot cube upon which is inscribed the entire document as it has evolved.